"Move Over QuarkXPress, Competition Is Here!" Click on a thumbnail to enlarge it. Use your browser's "BACK" button to return to this review when done. InDesign 1.0, by Adobe Corporation, is a new high-end page layout program created for graphic designers, production artists, and prepress professionals who want to design on the desktop but can print on a commercial offset press or a desktop printer. InDesign is not a new version of PageMaker; rather it is a totally new application with over 1,400 features, many new to a page layout program. Adobe's plan is to give QuarkXPress, which has cornered a large portion of the professional page layout market, a run for its money--InDesign lets you open QuarkXPress documents; even use QuarkXPress keyboard shortcuts, for those of you that want to jump ship now; and has lined up nearly 100 QuarkXTension developers to develop similar plug-ins for InDesign. The program displays a smooth integration of bitmap image and vector illustration management and editing into a strong page-layout application. InDesign looks like Adobe Illustrator and Adobe Photoshop, sharing many of the same tools, palettes, and commands, which makes it easy to learn and use if you are already familiar with Adobe products. 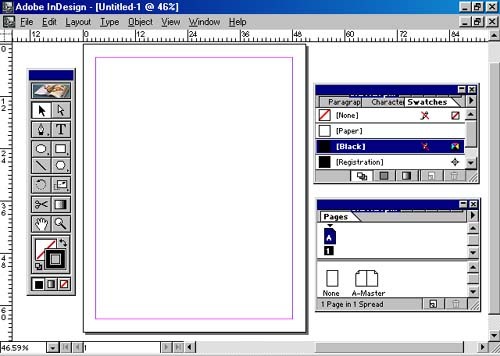 Does this first version of InDesign include every graphic and layout tool you have ever wanted? No, but what it does include is impressive: work with page sizes up to 18 feet square; use a multi-line text composer; hang a capital "S" or a period outside the margin; specify position values to 0.0001 of a unit; zoom to 4,000 percent; shear and rotate a group of text and objects; undo to your heart's content; and place a frame; within a frame within a frame without losing individual selectability or editibility, to name just a few of the features. Advanced Beginners, Intermediate or Advanced Users. Anyone familiar with other Adobe products will find this program easy to learn, as it shares many of the tools and features you find in Photoshop, PageMaker, and Illustrator. The program comes with an informative User Guide, an extensive on-line Help, and the movies and tutorials on the CD provide information and step-by-step instructions about the features. There are excellent books on the program as well, such as the Adobe InDesign Classroom in a Book and the Peachpit Press book, InDesign: Visual Quickstart Guide (see our review). The User Guide and the Peachpit Press book both have an excellent chapter comparing the different commands and keystrokes for InDesign and QuarkXPress. The Adobe Web site offers additional information and tips and tricks. Installation, Manual, & Help: Installation is easy and quick. All of the Adobe products include additional material and InDesign is no exception, so check out the CD. The manual, On-line Help, and Tutorials are useful to get you started. There are three tutorials, excerpted from the Adobe InDesign Classroom in a Book, on the CD that I found useful: Setting up your Document; Working with Frames; and Colors, Tints, and Gradients. Chapter 1 of the User Guide is also an instructional tour with step-by-step instructions and explanations of features and tools. Adobe also provides a Quick Reference Card with all the shortcuts and palettes that you can keep by your computer for reference. 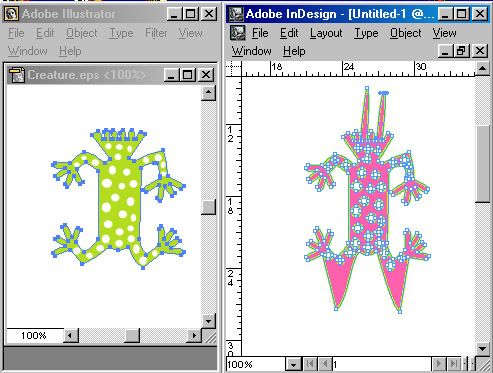 Interface: InDesign has a similar look to Illustrator and Photoshop. They share a variety of common tools, commands, palettes, and other interface elements. You will find familiar palettes such as: Color, Swatches, Align, Attributes, Gradient, Library, Links, Transform, Character, and Paragraph. There is also the handy, Adobe-standard Navigator, as well as the pen, type, hand, zoom, and gradient tools, which work the same across all three Adobe programs. The program has versatile zooming controls, and you can zoom out to a 5% view and in to a 4,000% view. 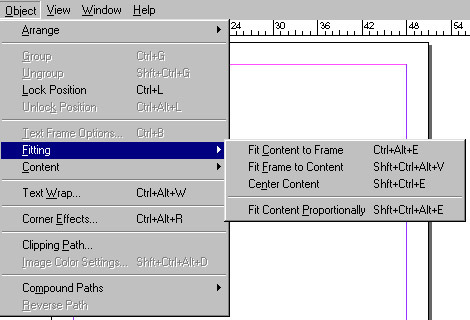 The range of zoom controls include: a menu in the lower-left corner of the document window; keyboard shortcuts; or the Navigator palette, which can be set to display one spread or multiple spreads. You can set up nonprinting document grids, baseline grids, and page or spread-size ruler guides to precisely structure your designs and position your text and graphics. 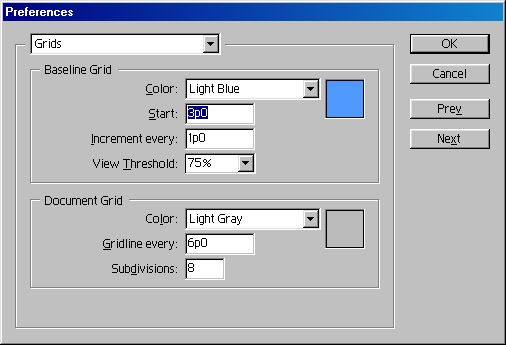 The exact size of the snap-to zone can be set for grids, and InDesign includes customizable view thresholds to make sure that tools such as baseline grids, document grids, and guides appear and disappear at the right times. The image to the left shows a document with a baseline threshold set at 100%. The left side shows the document with a visible grid using 100% zoom, and the right side shows the document with an invisible grid using 80% zoom. You can color, hide, show, lock, move, or copy and paste ruler guides, and since Indesign treats ruler guides as objects, you can use the Transform palette to position guides accurately or store them on a layer. InDesign works identically on both PC and Mac platforms, so if you need to move from platform to platform to do your work, all of the features available to you in one version of the program will be available to you in the other. You can can also move files across platforms easily. Not only is the interface similar to other Adobe programs, InDesign shares the core Adobe technologies with Adobe Acrobat 4.0, Photoshop 5.5, and Illustrator 8.0, which improves consistency and streamlines work among these programs. Support of Native QuarkXPress, and PageMaker Files: InDesign preserves your investment in QuarkXPress 3.3 - 4.0x and PageMaker 6.5 files. They are converted on either platform to InDesign documents. It protects text attributes wherever possible, maps masked objects to frames, preserves embedded profiles in images, translates most color management settings to equivalent settings in InDesign, and handles other aspects of the conversion. Adobe also plans to make a QuarkXPress conversion kit available to provide detailed information about managing that process. 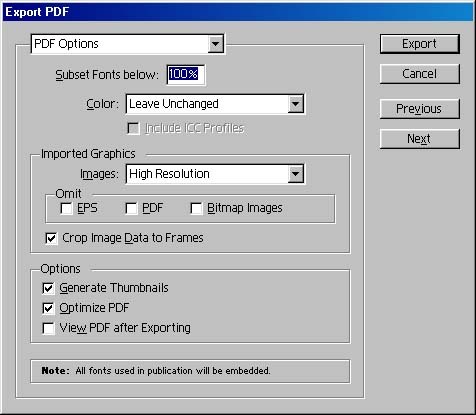 Support for PDF Format: InDesign's support for Adobe Portable Document Format (PDF files) is excellent. PDF files are compact documents based on the Adobe PostScript language and contain all of the font, graphics, and color information necessary to preserve the look and content of an original design file. PDF files are designed to be portable across computer platforms and output devices, and to support on-demand printing and high-end prepress workflows, as well as on-screen viewing and Web distribution. Native PDF files can be opened in InDesign, and you can export files directly in PDF format without stepping through an intermediate program like Acrobat Distiller. InDesign exports PDF files in the new PDF 1.3 format, which supports ICC profiles for color management, smooth shading for cleaner gradients, glyphs for special characters such as ligatures, and other high-end features. When you export your files, in InDesign, as PDFs, you can set the image compression, font embedding, and color conversion options. The image to the right shows the dialog box for exporting a PDF file. 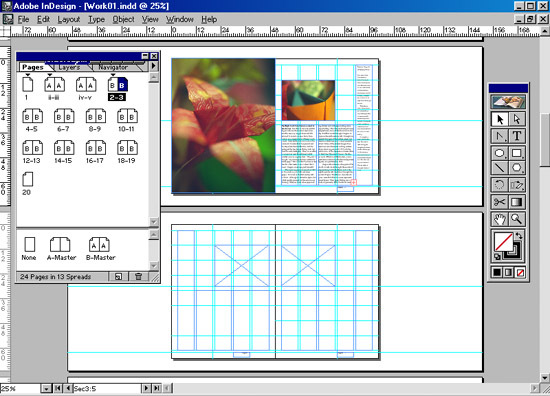 The image to the left shows the dialog box for incorporating a PDF file into InDesign. Support of Native Illustrator and Photoshop Files: InDesign also opens native Illustrator and Photoshop files. You can place artwork and images from Illustrator or Photoshop; copy and paste or drag and drop Illustrator artwork into your layouts--the pasted or dropped artwork then becomes editable InDesign objects. You can modify this artwork with the pen tool, apply different colors to it, change the fill and the stroke, or make other edits. The image to the left shows an EPS graphic that was dragged and dropped from Illustrator to InDesign and it still was completely editable. And color swatches can be created, saved, and shared between InDesign, Illustrator, and Photoshop. Bezier Tool and Compound Paths: Because of InDesign's drawing support, you don't have to switch to another program for drawing or editing images. It has a pen tool and other Bezier drawing tools to create graphics or quickly edit other artwork that you have dragged or pasted into a document. You can split paths apart with the scissors tool, or combine paths together into compound paths. Text can also be converted to paths and then filled with images, graphics, or other text. For the image to the right, I converted the blue text to to a path; placed graphics within it; then converted the rest of the text to a path and used the anchor points to distort all the text. I used the Bezier tool to create the star shapes in the image to the left; placed then on a blue background; converted all the objects to a compound path to get transparent areas; placed the face images behind; and created two more star shapes to get another transparent shape. I copied the original face and then rotated and flipped it in different directions. I used a special corner effect for the blue background and used a gradient fill for the type. The image shows how you can create transparent frames within frames within frames to get the look you wanted. Text and Graphics Frames: You can be creative when working with text and graphics frames in InDesign as the program is very flexible and just uses one style of frame for both graphics and text. Every object is either the content of a frame or a frame that holds other content. Words, text blocks, images, and graphics appear inside a graphics or text frame and almost any object can be a frame, including rectangles, ovals, polygons, hand-drawn shapes, and converted text. Frames can be set up in advance or you can create them on the fly as you place text and graphics. You can use frames to: crop a graphic by pasting it inside a frame; paste a frame and its contents within another frame to create different masking and layout effects; apply a stroke or fill to a frame to create a border or background; fit the frame to the content, or the content to the frame, or even center content in a frame; and easily edit the shape of a frame that contains content to fine-tune the overall result. When you paste a frame within a frame, you still retain complete control over the nested frame and can move, resize, rotate, shear, and otherwise manipulate it. Inline graphics can be produced so your graphic stays with certain text. Columns and an inset or space between the frame and the text in the frame can be created. Placehold frames can be set up for templates, and you can always override them. To create the image to the left, I started with a file from Adobe that had no text, then placed a text file into it. I flowed the text into two columns; edited the shape of the text frame using the direct-selection tool and the pen tool; added an additional graphic and used text wrap to flow the text around it. The image to the right shows a before and after page of an exercise that I did from the frame tutorial that came with the program. 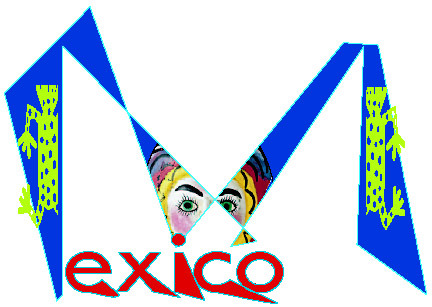 I resized and changed the shape of the text and graphics frames; used anchor points to reshape the text frames; converted graphics frames to text frames; wrapped text around an object; fit the content to a frame; changed the stroke color and weight of frames; and centered, scaled, and rotated frames to get the final result. Gradient Fills and Strokes: InDesign lets you create a gradient, which is a graduated blend between two or more colors, and then save the gradient in the Swatches palette for ongoing use on frames, lines, text, and multiple objects. Gradients can make your images unique. Radial or linear gradients can be created, and applying gradients to a text or graphical object's stroke and fill is as easy as applying a color. There is also a gradient tool so you can adjust the angle or starting point of a gradient, plus spread a single gradient across multiple selected objects. 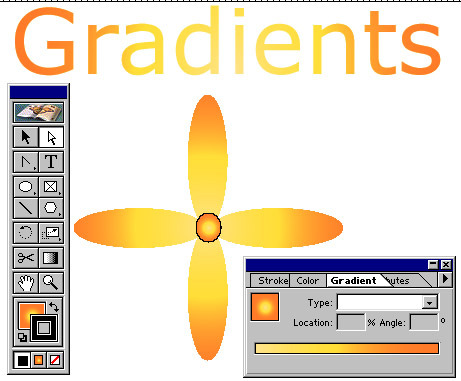 For the image to the right, I made a gradient named Sunshine and saved it to the Swatches palette. Then I drew the daisy shape and applied the gradient. The same gradient was then applied to text. Clipping Paths: Finally, a layout program that lets you incorporate and edit clipping paths. When working with images, you may need to mask parts of them, so that only certain image areas are visible. In most graphics programs, you do this by creating clipping paths, which define what's visible and what's not. With InDesign, graphics frames work the same way as clipping paths--allowing you to mask or clip areas of imported images and vector graphics. 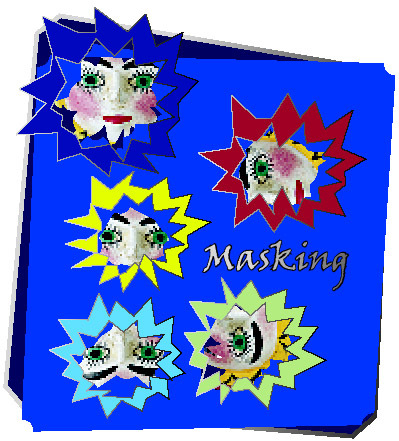 You can mask such formats as: TIFF, EPS, PDF, DCS, Photoshop, and JPEG. 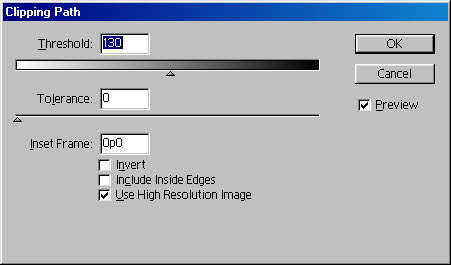 InDesign also recognizes clipping paths saved in Photoshop, EPS, or TIFF graphics and gives you the choice, on import, of whether to use a clipping path as the graphics frame for an image. Then the program uses the clipping path data to create an editable frame. You can also generate clipping paths automatically in InDesign using the Object > Clipping Path command, or you can draw clipping paths by hand. When using the Clipping Path command, you can preview how your clipping path looks and fine-tune your threshold and tolerance settings. 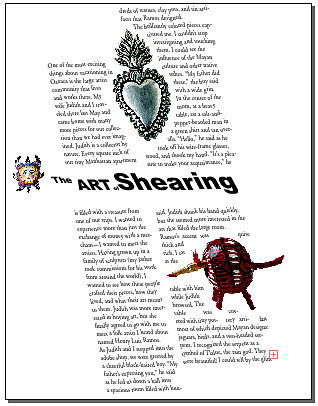 With the image to the right, I brought in the heart graphic, creating a frame from the clipping path, and placed it in the text and used text wrap. I then brought in the armadillo image which did not have a clipping path. I placed it on a blue square and you can see how the opaque background of the armadillo graphic obscures the blue background. 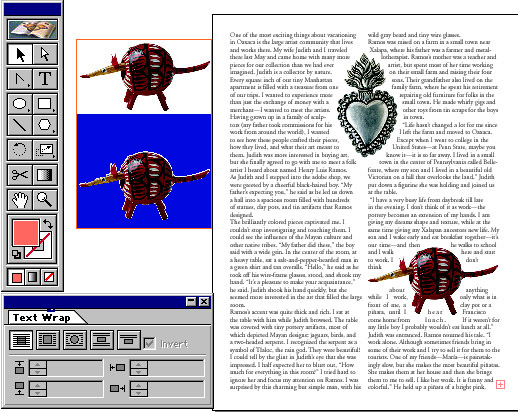 I then placed the armadillo graphic again, and used the Clipping Path command in InDesign to reduce the opaque background. 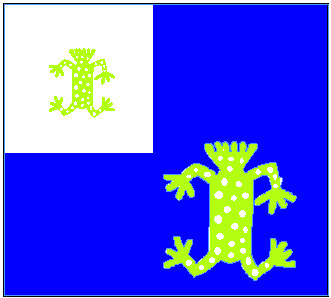 The image to the right shows a PDF graphic placed on a blue background without a clipping path and then with a clipping path, where you can see the opaque background disappears. 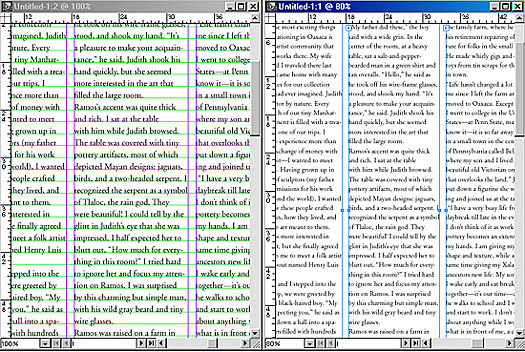 Scaling and Shearing Text and Graphics: With InDesign, you have the ability to select multiple text and graphics frames, with their contents, and then scale and shear them. And the Transform palette has a position proxy feature which allows you to specify if a transformation should work from the center or from any of the corners of a frame. If you include text in these transformations, the text remains editable. For the image to the right, I used a previous graphic, scaled and sheared both the frames and their contents and added text that I had sheared. 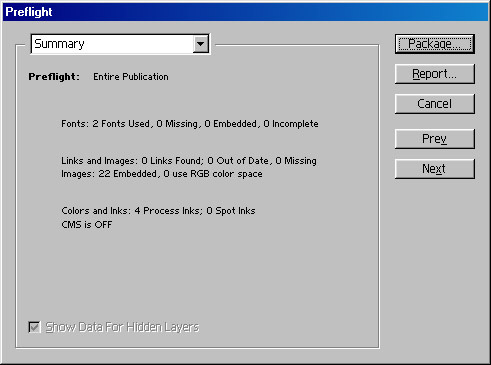 Page Layout Features: InDesign offers an extraordinary range of page layout options. You can create custom page sizes as small as 1 pica (1/6 in., 0.421 cm.) square or as large as 1,296 picas (18 ft., 5.48 meters) square. You can also select predefined page sizes, and any document can contain up to 9,999 pages. Pages can be organized into spreads of up to 10 pages, and every spread has its own pasteboard for storing spread-specific items. 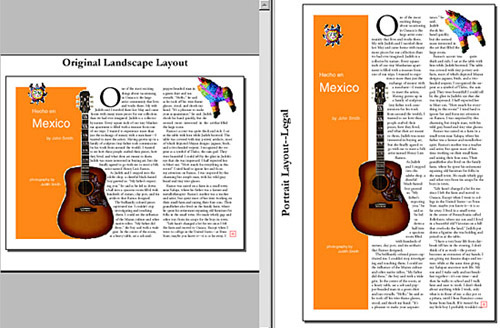 For layouts of more than two pages, you can create an island spread or accordion foldouts, like the three page spread used in the Adobe Quick Reference Card that comes with the program. 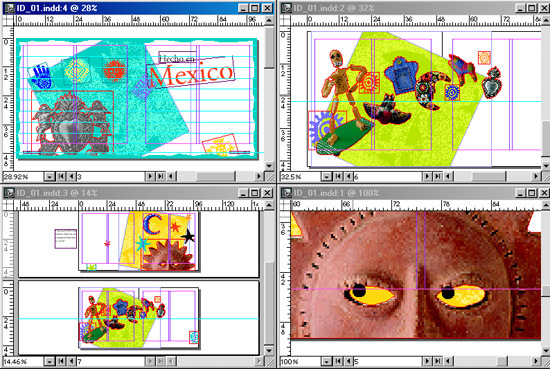 The image to the right shows an example of a layout with a three page island spread. Page Numbering: The program also provides support for documents that need different sections, each with its own page numbering, such as a book containing front matter that's numbered with Roman numerals (i, ii, iii,) while the rest of the book uses Arabic numerals. With the Page palette, you can set up all of the pages in a document and then organize continuous page ranges into sections, each labeled with appropriate page numbers. You can specify the starting page number for each section or set it to continue from the last section, and include a section label, such as "Introduction" or the name of the magazine section. Multiple Master Pages: The ability to set up multiple master pages for any document helps you streamline your work. Any number of master pages can be set up, including singe-page and multi-page masters. Master pages can contain: headers, footers, page numbers, drawn objects, and other elements that you want to use over and over. You can convert a regular page to a master page and also base one master page on another. If you then edit the "based-on" (parent) master page, the changes also appear on the "subordinate" (child) master page and any pages with this subordinate master page applied. After applying a master page to a regular page, you can override attributes of master page items. Document-Wide Layers: InDesign supports document-wide layers which helps you manage and work with objects more efficiently. You assign text, graphics, ruler guides, and other elements to layers, and then hide, show, reorder, and lock layers as necessary. They can be used to organize certain elements on layers and then hide those layers to make it easier to focus on specific areas of your design. Layers are useful for creating multiple versions of a document within the same file: to make different language versions of a document or to create regional versions of a marketing piece using different pricing information, part numbers, and sales contacts. Then when you are ready to print, you can hide or show layers and then print only the visible layers. The image to the right shows a page layout where the items are put on separate layers for easy manipulation. Multiple Views: With InDesign, you can open more than one view of a document to see how your choices affect the overall design. For example, you could open two views of the same page to kern text more efficiently. In one view, you could zoom in on the text at 800% to finely control the letter spacing. In the other view, you could stay at 100% to see how the kerning affects the overall look of the text in a larger context. You can also open views of multiple pages to see how adjustments you're making to threaded text on one page affects your layout on another page, or to keep the design of one page close by as you focus on the design of another page. 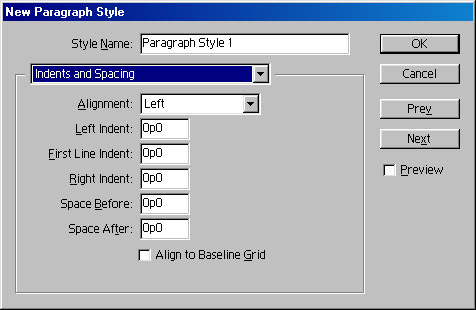 Character and Paragraph Style: With InDesign, you can define both character styles and paragraph styles. 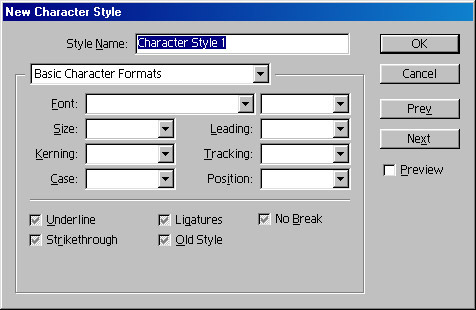 Character styles include settings for font, size, leading, kerning, ligatures, case, position, baseline shift, color, overprinting, and other character-level attributes. You can base one style on another. Attributes for paragraph styles range from setting the composition engine to specifying drop caps, indents, spacing, hyphenation, tabs, keep options, character formatting, style after, and more. Automatic Layout Adjustment: For those indecisive designers who change their mind about layout setup after the product is finished, InDesign has a timesaving feature that automatically reformats your document. When you choose Layout Adjustment, InDesign applies an artificial intelligence engine to assess a document's structure and quickly revise its layout. It uses ruler guides, margins, and columns for adjustments, so you can try out different page orientations, page sizes, or column and margin sizes and let InDesign show you the results. The image to the right shows an original landscape, custom size design and then the changed portrait, legal size design that was obtained by using the Automatic Layout Adjustment. Preflighting and Packaging Files: If you have every taken a project to a service bureau and found out that you were missing fonts or another essential file, you will appreciate InDesign's preflight utility. It scans your documents and identify problems, such as missing links, fonts, or color management profiles. It also details your current printing settings for you and your service provider to review. You can generate a text-only file with detailed information about the document's contents and also have the utility copy the file and its external components to a folder for efficient hand-off. Typographical Composition Engine: InDesign offers you two composition engines--the single-line composer and the multi-line composer. Both composers work by applying the type settings you specify to determine how much text fits on any line and how many lines fit in any text frame. The single-line composer looks at one line at a time; while the new multi-line composer considers multiple lines at once (you specify how many), and looks both forward and backward in a paragraph. The multi-line composer favors even spacing, avoids hyphenation whenever possible, and assigns penalties to good and bad breakpoints, thus you get better spacing. 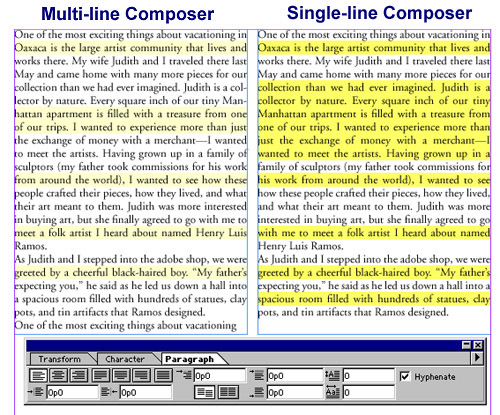 The image to the right shows a section of text using the single-line and multi-line composer. InDesign highlights compositional problems in yellow. Light yellow indicates minor problems, while stronger shades of yellow indicate more severe problems. Ligatures: Another great typographical feature is the ability to automatically insert ligatures as you type--ligatures are typographic replacement characters for certain pairs such as "fi" and "fl." InDesign uses the ligatures available in a font's character set or creates its own, and these characters are fully editable and do not cause the spell checker to flag words containing them. 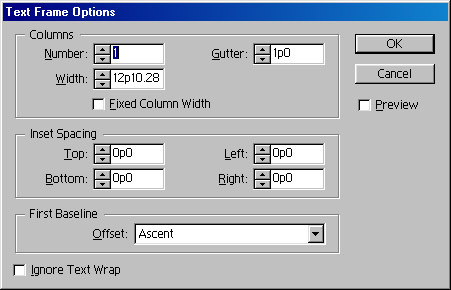 Optical Margin Alignment: InDesign also supports a story-level attribute, optical margin alignment, that adjusts the position of punctuation and text characters at both ends of a line. Punctuation marks such as periods, commas, quotation marks, and dashes, as well as edges of letters such as W and A are hung outside margins, making the edges of the text frame appear more even. A Flush Space: There is also a new character that InDesign is featuring: a flush space. It's designed to absorb extra space in a line. For example magazines often include a right-aligned, end-of-story character in the last paragraph. If that paragraph is also fully justified, the last line may include unsightly gaps. Inserting a flush space absorbs the extra space in the line, allowing the words to congregate at one end of the line and the special character to align to the right without a conflict. Kerning Options: InDesign provides four different kerning options for achieving precise spacing between characters: (1) Manual Kerning--You can manually kern letter pairs with precision to .001 of an em space, using either keyboard shortcuts or the Character palette; (2) Optical Kerning--When you set this option in the Character palette, InDesign automatically determines the ideal spacing for the selected characters, a visually great solution if you're moving fast to meet a deadline or if you've mixed different fonts and sizes in a single word or line; (3) Metrics Kerning--Many fonts come with built-in pair kerning metrics, offering excellent typographical results. InDesign uses metrics kerning by default, so it automatically honors kern pairs when you import or enter text. ; (4) Range Kerning or Tracking--You can specify tracking values to adjust the spacing across multiple characters in a line. International Language Support: The program provides rich language support, offering 21 language dictionaries as a standard part of the program. 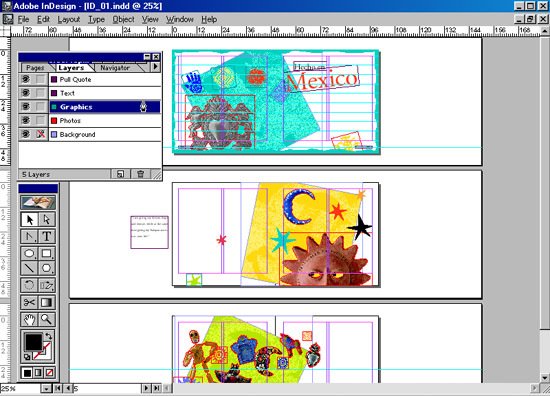 Some programs such as QuarkXPress have you buy a new copy of the program for each language. You can associate a language with a character, a word, a paragraph, or a lengthy piece of text. It is also possible to specify a language as an attribute of a character or paragraph style, and InDesign then automatically uses the appropriate language to handle spell checking and hyphenation. There is also support for installable hyphenation and spelling systems, giving you control of the systems you use for a particular language, so for example you could use Proximity dictionaries for English text and Diekmann dictionaries for German text. 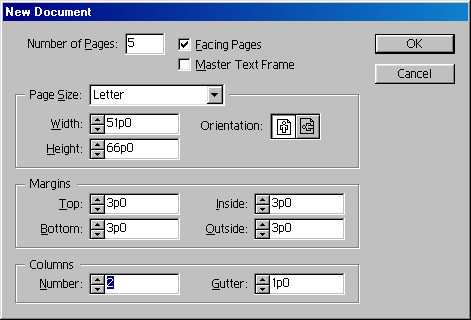 Printing Features: InDesign can print to any PostScript Level 2 or PostScript 3 device, as well as to PCL 5 and later printers. With nonPostScript printers, though, most of the advanced printing options are not available. The program has excellent support of PostScript 3 options such as in-RIP trapping, separations, and color correction. It can also read OPI comments in EPS and DCS files and write them when outputting PostScript. The program saves time when you process masked or cropped images, sending to the RIP only the portion of the image that's used rather than the entire image. When I first received Adobe InDesign for review I was not sure what to expect. Usually with a first version of a program, there are enough problems that a prudent buyer is better to wait for updates. I had also heard various rumors that it wasn't the "QuarkXPress Killer" it was touted to be; and it was hard to learn; it did not include certain features so it had limited use. But after trying the program, did I like it? Actually, I felt like the woman in the shampoo commercial and wanted to stand up and shout, Yes, Yes, Yes, in support of the program. 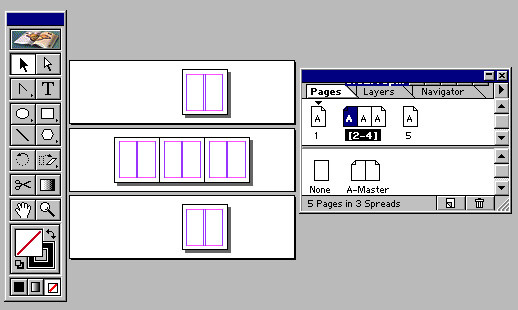 Adobe had read my mind and produced a robust page layout program with great drawing features. Establishing a new program is a long-term process, and Adobe has a great beginning with InDesign. The performance of its core design tools is impressive. Support of third-party developers will help. InDesign, Photoshop, and Illustrator all are based on the same graphics engine so you get a more consistent treatment of onscreen display, type, printing, and color, as well as seamless file sharing between applications. The learning curve for designers who work with Photoshop and Illustrator, which shares the tools and palettes, is greatly reduced. Do I think it is a "QuarkXPress Killer?" It just could be over time, but it is far to early to pick a winner. Do I care who wins? No. What is important is that competition between companies can only be beneficial to consumers. What is important is that I found InDesign easy to learn and use and fun! Anyone familiar with PageMaker and Illustrator will probably feel the same. It doesn't include all the features or options I would like, but I am more impressed with what it does include than disappointed with what it doesn't. If you have ever designed your graphics in Illustrator, then brought them into PageMaker for your page layout; then had to bring them back into Illustrator for adjustments, you will love InDesign. Many of your drawings can be created right in InDesign, and that special tweaking of imported graphics can also be done right in the program. Adobe certainly gets two thumbs up, way up, for this first version of InDesign. For PostScript printers: Adobe PostScript Level 2 or later required. Adobe PostScript Level 2 or later printer.